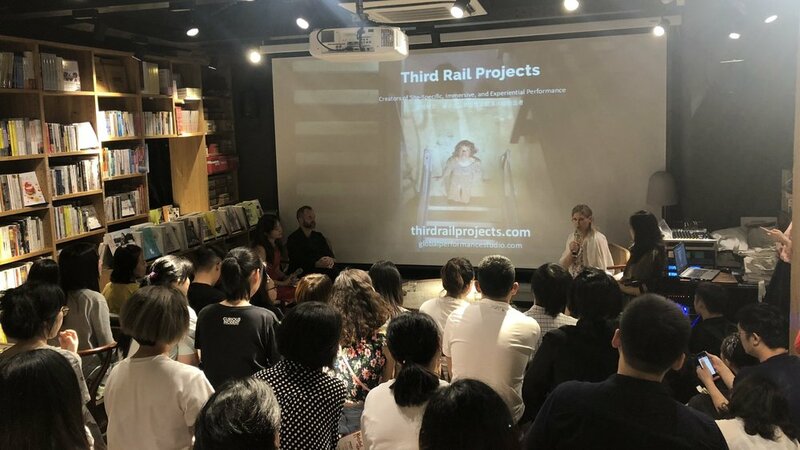 Third Rail Projects and the Global Performance Studio in collaboration with China Dream Live Entertainment (CDE Live) presented a comprehensive Immersive Theater Workshop led by Co-Artistic Directors Tom Pearson and Jennine Willett. 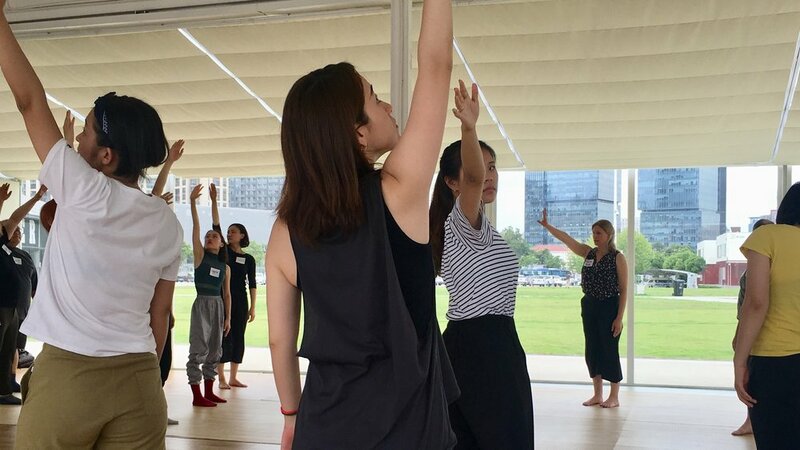 This four-day intensive workshop was geared towards experienced artists, theater directors, choreographers, and performers interested in working in the medium of immersive, site-specific, and experiential performance. The curriculum explored methods for creating, directing, and performing in these non-traditional theater formats and ways of crafting meaningful, resonant, and engaging audience experiences. Participants received hands-on training and active involvement in the workshop, where they worked together in a collaborative environment that fostered experimentation and discourse. Hailed as one of the foremost companies creating site-speciﬁc, immersive and experiential dance and theater, Third Rail Projects, led by Artistic Directors Zach Morris, Tom Pearson, and Jennine Willett, is dedicated to re-envisioning ways in which audiences engage with contemporary performance. They have made work in New York, nationally, and abroad since 2000. Their currently running, award-winning immersive hit Then She Fell, was named as one of the “Top Ten Shows of the 2012” by Ben Brantley of The New York Times, and acclaimed as one of the best theater experiences of 2013 by Vogue. Most recently, the company premiered Ghost Light, an immersive “performance about performance,” in and around the Claire Tow Theater at Lincoln Center Theater. In 2016, the company premiered four major works, all of which were met with massive critical and audience recognition: As Time Goes By in St. Petersburg, Russia, Sweet & Lucky with the Denver Center for the Performing Arts, Learning Curve with Albany Park Theater Project in Chicago, and The Grand Paradise, in Brooklyn. Third Rail Projects has been the recipient of several prestigious awards, including two New York Dance and Performance (Bessie) Awards for Then She Fell (2013) and Vanishing Point (2008), and a Chita Rivera award for Outstanding Choreography in an Off-Broadway show for Ghost Light. The artistic directors were recently named among the 100 most influential people in Brooklyn Culture by Brooklyn Magazine. Fundamental to Third Rail Projects is the notion of re-imagining contexts for presenting contemporary work. Collaboration is integral to all of Third Rail Projects’ endeavors, both in the creative process as well as the intersection with each new site, community, and cultural landscape in which they work. Tom Pearson is a Bessie award-winning director and choreographer working in a variety of media that includes interactive and immersive theater, contemporary dance, site-speciﬁc performance, ﬁlm, visual art, and large- scale art installations. He is Co-Artistic Director of Third Rail Projects and helms the international programs for the company as the Director of the Global Performance Studio (GPS.) The Global Performance Studio has worked with artist populations in a variety of international communities to develop innovative site-speciﬁc and immersive works and to share creative methods. Tom has taught domestically and abroad for more than 20 years: as adjunct faculty for Florida State University and the Florida School of the Arts and through workshops, lectures and panels with Actor’s Theater of Louisville, New York City Opera, American Dance Festival, Town Hall, The LaGuardia High School for the Performing Arts, Swarthmore College, New York University, the Public Theater, Columbia, and internationally with MindPark in Shenzhen, CEC Artslink in Russia and Central Asia, and with the Hong Kong Youth Arts Foundation, among others. Tom received his MA in Performance Studies from New York University Tisch School of the Arts and his BA in Literature and BFA in Dance from Florida State University. Jennine Willett is a Bessie-Award winning choreographer, director, performer, writer, and educator and is Co-Artistic Director of Third Rail Projects. At the helm of the company’s education initiatives and curriculum, she teaches workshops, master classes, and residencies that share the creative methods and skills that come into play when devising, directing and performing in both traditional and non-traditional formats. Her courses attract artists of all ages and disciplines and she creates a learning environment that encourages dialogue, experimentation and collaboration. She also advises and consults for academic institutions and producers to help them realize their performance visions and discover the right medium for the message. Jennine has served as a Visiting Artist at Princeton University and as an adjunct faculty member at Swarthmore College and Florida State University. She has offered workshops, courses, and lectures for numerous academic institutions and arts organizations, such as Columbia Teachers’ College, Rutgers University, Lincoln Center, Hunter College, The Actors Studio Drama School at Pace University, Primary Stages Einhorn School of Performing Arts, Materials for the Arts, and Gibney Dance. She received her MFA in Performance and Choreography from Florida State University. Founded in 2016, China Dream Live Entertainment Ltd. Co. (CDE Live) is a subsidiary of CMC (China Media Capital) Holdings. CMC Holdings is a leading investment and operating platform in media and entertainment industries, with a broad industrial layout covering content, platform, technology, service and other niche segments. CDE Live has two main business lines: to produce and present the world’s greatest live entertainment content, and to manage professional theatres in China. Led by one of the first Chinese theatre producers, Miss Tian Yuan, CDE Live aims to be China’s premier live theatre organization. 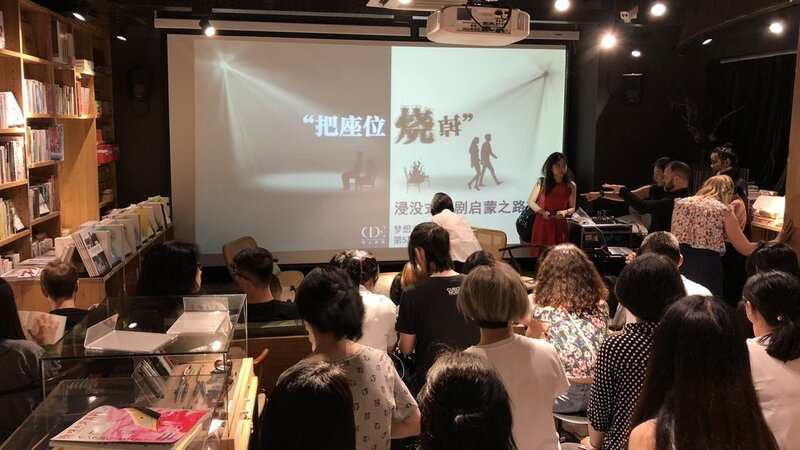 CDE Live’s leadership team has brought original tours of classical musicals to China, such as Phantom of the Opera, Cats, and Mamma Mia!, and produced Chinese versions of Cats and Mamma Mia!. In 2017, CDE Live has successfully produced Chinese versions of Tony-Award winner A Gentleman’s Guide to Love and Murder, Off-Broadway hits Little Shop of Horrors, and Murder Ballad. CDE Live’s mission is to lead the development of live entertainment in China by providing high-quality content, fostering local talents, operating world-class theatres, and encouraging international creative exchanges.